It’s strange how certain dates stick in our minds. Today is one of those dates, one of those “Where were you when?” days. Sometimes the date becomes significant, but we forget way. Cinco de Mayo, is a huge celebration in the United States, even more than it is celebrated in Mexico. It occurs on May 5th, of course. But, most Americans couldn’t tell you why it’s significant. If pressed we might offer up a suggestion of “Mexico’s Independence Day.” It’s not. It’s the date of a significant battle between the Mexicans and the French. Other times, the event itself is so shocking, so noteworthy, that the date becomes impossible to forget. September 11th, is one of those days. No one who was old enough to watch television that day will ever forget. Often we remember where we were, what we were doing, who we were with. Today, May 18th, is one of those days for me. Thirty-six years ago today, I was 14 years old, living with my family in Olympia, WA. It was a Sunday morning and my brother Richard and I were getting ready to go to church. At about 8:30, some 200 miles to the South, a mountain blew up. 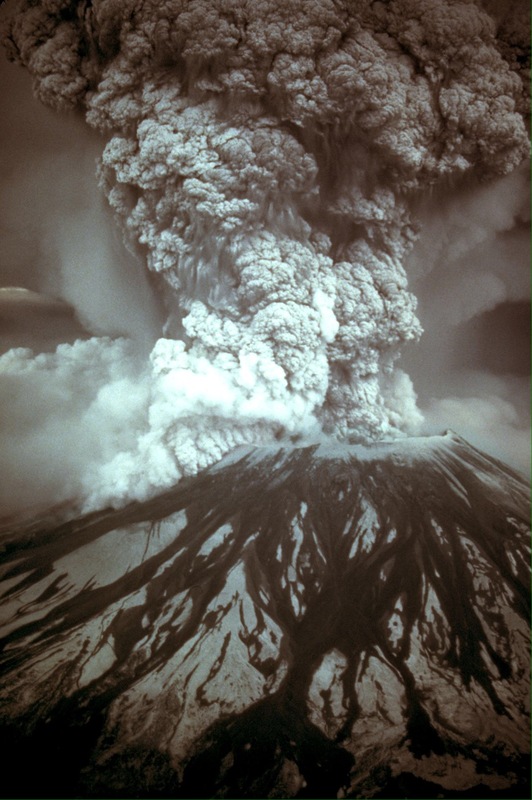 In one of the most spectacular and well documented eruptions in history, Mt Saint Helens blew over 1,300 feet of dirt, rocks and mostly ash off the top of what had been one of the prettiest mountains in the Cascade range. The ash cloud was visible for miles. I remember standing on my front porch looking South. The southern sky was filled with clouds. Living in Western Washington, that wasn’t unusual. These clouds however, were growing. Just standing and watching, I could literally see them climbing into the sky. The ash cloud would reach 80,000 feet: fifteen miles into the air. The explosion was estimated to be in the 10-50 megaton nuclear bomb range. The largest man-made explosion ever was a 50-megaton bomb. (1 megaton is equivalent to one million tons of TNT.) The eruption was 2500 times as powerful as the bomb that destroyed Hiroshima. Fifty-seven people died in the explosion, we think. There’s still some debate, but that number is pretty close. One of the most colorful characters was an old man named Harry S Truman. He was essentially a hermit who lived in a cabin in the forest on the mountain. When the earthquakes started a few weeks before the actual eruption, the area around the mountain was evacuated. Harry, refused to go. He insisted that he had lived his life on the mountain and that’s where he wanted to die. But, Harry, we don’t want to leave you all by yourself up here. I won’t be by myself. I’ll have the company of Jim Beam, Johnnie Walker and Jack Daniels. No trace was ever found of Harry or his cabin. He probably died before he even knew what hit him. Here’s to Harry and the other 55, or so people who lost their lives that day. Our small efforts to reshape the environment pale compared to what nature can occomplish in an instant.